I returned from Northwestern University early this morning after a landing on a delayed United flight from Chicago O'Hare to Bradley airport in Hartford/Springfield that was preceded by an announcement by the pilot that we will be experiencing "extreme turbulence." My trip began about 5:30AM Thursday morning when I was picked up by a van service in Amherst only to have the shuttle to which the other passengers and I were to then be moved to get a flat tire right in front of Mount Holyoke College in the dark of night. Luckily, our shuttle was still in good condition so we did a swap and arrived at the airport in time for our flights. Travel is never dull and especially in the midst of a frigid winter. My destination was Northwestern University, where its Transportation Center, directed by Professor Hani S. Mahmassani, was hosting a Symposium on Transportation Network Design and Economics. The symposium was to mark the visit of Professor Martin Beckmann (who was on my doctoral committee at Brown University) and the complete symposium agenda can be found here. The symposium was outstanding and brought together researchers in engineering, economics, operations research, regional science, and even physics. I especially appreciated the attention to detail in the organization of this symposium with sufficient time scheduled for many exciting discussions, wonderful coffee breaks, and a delicious free lunch. Professor Beckmann had arrived on Wednesday having traveled first from Providence to NYC, where he saw an opera and visited museums. He had taken an Amtrak sleeper car from NYC to Chicago (he believes in experiencing many different modes of transportation) and told us that the service was great but his sleeping compartment was rather cold. He is traveling back to Providence also on Amtrak (but through Washington DC). Professors Mahmassani and David E. Boyce are to be congratulated as well as the staff of the Transportation Center at Northwestern for organizing an exceptional venue and very stimulating symposium program! The discussions that took place germinated numerous research questions and ideas on a topic of great relevance regionally, nationally, and globally. The audience included faculty, students, and practitioners. There were participants from Northwestern University, the University of Illinois at Urbana, the University of Illinois at Chicago, Purdue University, Roosevelt University, Loyola University, and UMass Amherst, as well as individuals from the Chicago Transportation Authority, Cambridge Systematics, the Chicago Metropolitan Agency for Planning, and several independent consultants. The symposium was a perfect way in which to honor the lasting contributions of Professor Martin Beckmann to the economics and science of transportation networks! It was thrilling to, once again, see Professor Beckmann, who is 85 years old, and whose wit and brilliance still astound. The photo above of Professor Beckmann with me was taken at the lovely dining hall at the Allen Center at the Kellogg School at Northwestern University on January 28, 2010. What can biology teach us about adaptive network design? That is the question underlying an article in The New York Times that is reporting on the paper published in Science by Tero, Takagi, and co-authors, entitled, Rules for Biologically Inspired Adaptive Network Design. The article appears in the January 22, 2010 edition of Science, pp. 439-442. The Times article with the catchy title, Slime Mold Proves to be a Brainy Blob, intrigued me so I also read the scientific article that it was based on. Interestingly, the researchers, based in Japan and England, used amoeba to "reproduce" the rail network of Tokyo and also developed a basic mathematical model for adaptive network design. They, however, do not cite any literature prior to 1996 and, coincidentally, as I have been writing in this blog, Northwestern University is hosting a Symposium on Transportation Network Design and Economics this coming Friday to mark the visit of Professor Martin Beckmann who co-authored a landmark book on transportation, which discussed decentralized versus centralized behavior, with mathematical models, in 1956! Nevertheless, I was pleased to see that the authors of the Science article cited (as their earliest reference) a paper published in 1996 in the International Transactions in Operational Research (ITOR), which I am on the editorial board of, and which is now edited by Celso Ribeiro of Brazil. That article, Heuristics from Nature for Hard Combinatorial Optimization Problems, was authored by Colorni, Dorigo, and others, who are based in Italy. Interestingly, the ecology community, led by Mullon and colleagues in France, which is also part of the biology community, is now also applying concepts of network equilibrium from operations research and economics, as their work on (with special relevance to fisheries) demonstrates. Indeed, my Network Economics book has inspired, in part, their work and they acknowledge accordingly. The Boston Globe has a wonderful article on Vladimir Ducasse, a UMass Amherst football lineman, who is trying out on the Gulf Coast for the Senior Bowl with dreams of being selected by the National Football League (NFL). The article traces the history of this star athlete and discusses his focus and discipline in light of the earthquake and devastation in his birthplace, Haiti. The article notes that Ducasse selected UMass Amherst, first and foremost, for its academics, and, next, for its athletics -- football. It talks about the trust that he has earned and his love and respect for the coaches as well as his abilities to concentrate on the tasks before him, given the immense distractions of the events in his home country. We wish Vladimir Ducasse as well as his countrymen all the best as they begin to rebuild and reconstruct Haiti. Frank Carroll, the coach of several Olympic figure skaters, including Evan Lysacek and Michelle Kwan, said it well: You are only as good as your last student. The New York Times had a recent terrific interview with him in which he was asked whether having one of his students get a gold medal at the 2010 Winter Olympics (in this case Evan Lysacek) would be meaningful to him -- something that has eluded him. I do think that his quote has relevance also to a professor and especially when one considers one's most recent PhD student to graduate. My most recent PhD student, who received his PhD in May 2009 was Dr. Patrick Qiang. Above is an announcement for an upcoming talk of his at the university where he is now a faculty member. Interestingly, another former PhD student of mine who received his PhD in 2006 from UMass Amherst, Dr. Dmytro Matsypura, also has some great news to report. He has received tenure from the University of Sydney in Australia where he has been on the Faculty of Economics and Business for the past 3 years. He is in the Discipline (something like a Department in a US-based university) of Operations Management and Econometrics. Plus, he has been granted a sabbatical. He will be coming back to his alma mater as a Visiting Scholar. Being a professor is like being a coach and Frank Carroll said it brilliantly! The Transportation Network Design Symposium is this Friday and Admission is Free! I am delighted to be able to take part in the upcoming Symposium on Transportation Network Design and Economics that will take place this Friday at Northwestern University. Information is below. Professor David E. Boyce, along with Professor Hani S. Mahmassani, have made this symposium possible and I thank them. On the occasion of the visit of Professor Martin Beckmann to Northwestern University, a one-day symposium has been organized for January 29, 2010, on topics related to his seminal work on transportation network equilibrium and efficiency theory. In Part I of his 1956 book, Studies in the Economics of Transportation, co-authored with C. Bartlett McGuire [1925-2006] and Christopher B. Winsten [1923-2005], Martin Beckmann established basic principles for user behavior on congested transportation networks, as well as for optimal network vehicle flows, when user choices are respectively uncoordinated or coordinated. Beckmann’s contribution launched the new subfield of transportation network economics. Two ongoing international symposia (ISTTT and TRISTAN), the founding of three international transportation journals in 1967, 12 books and two academic handbooks may be traced to Beckmann’s pioneering contribution. Today, Beckmann’s findings are being applied to many congested economic network questions, not only to predict road traffic and public transit flows and to establish road tolls in cities around the world, but also to describe and route telecommunication flows on the Internet, and to price electric power transmissions through generation and distribution networks with many intermediaries and decision-makers. The Symposium on January 29, 2010, will bring together several leading academic researchers to address some of the implications of Beckmann’s contribution for unsolved problems. One focus of the discussion will be the design of transportation and similar networks (communication, electric power, the Internet). Although network design has been explored formally and informally over the past 60 years, operational design methods have yet to be regularly applied in the planning of large-scale transportation systems by public agencies or private firms. A second focus of the symposium concerns decision making about the pricing, expansion, operation or maintenance of such public and private systems. The Symposium is open to all interested persons - there is no fee to attend! Professor Martin Beckmann's 1956 book, Studies in the Economics of Transportation, is available online here. The Web of Science recently showed 527 citations of this book. Of these, 277 citations (53%) appeared since January 2000, illustrating the significance of this work today. The citing authors represented 39 countries throughout the world. Dr. Sun-Ki Chai, the program co-chair of the 2010 International Conference on Social Computing, Behavioral Modeling, and Prediction (SBP 2010), has announced that the conference program is now online. Registration for this conference as well as the tutorials prior and the workshop after is free! The conference takes place at the National Institutes of Health in Bethesda, Maryland, March 30-31, 2010 and registration is required. Information on the conference and the agenda are available here. 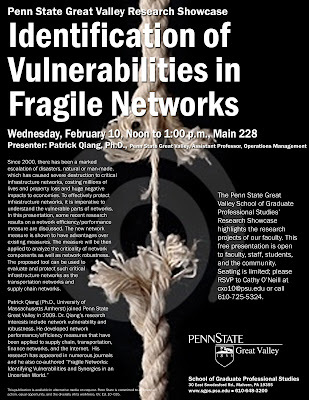 Dr. Patrick Qiang and I will be giving one of the four invited tutorials prior to the conference, on March 29, 2010, on the theme of our Fragile Networks book. The growing number of disasters globally has dramatically demonstrated the dependence of our economies and societies on critical infrastructure networks. At the same time, the deterioration of the infrastructure from transportation and logistical networks to electric power networks due to inadequate maintenance and development as well as to climate change, has resulted in large societal and individual user costs. This tutorial will focus on recently introduced mathematically rigorous and computer-based tools for the assessment of network efficiency and robustness, along with vulnerability analysis. The analysis is done through the prism of distinct behavioral principles, coupled with the network topologies, the demand for resources, and the resulting flows and induced costs. This tutorial will be taught in three modules. More information on all the tutorials can be found here. The 2010 Winter Olympic Games in Vancouver, Canada, begin in less than 3 weeks. The above mittens my daughter received recently from our friends in Vancouver, the Wassermans, whom we met in Stockholm, Sweden, when we lived at the Wenner Gren Centre, a housing complex for 150 families from across the globe, who are engaged in research. 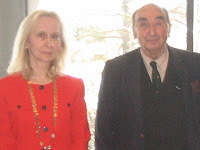 Dr. Wasserman was conducting research at the Karolinska Institute, the renowned medical research facility, whereas my husband and I were based at the Royal Institute of Technology (KTH). The Wassermans also visited us when we lived in Innsbruck, Austria, when I was on my first Fulbright. Although we won't (regrettably) be traveling to the Olympics (either as spectators or athletes) there is a local story to this international athletic competition. Amazingly, there are busses that will be used for transporting the athletes at the Olympic games that are from our area in Massachusetts. The Greenfield Recorder is reporting that the Kuzmeskus Bus company of Gill, Massachusetts, will be providing 6 bus drivers and 3 busses to shuttle the Olympians! The company is owned by the Kuzmeskus family. Their grandson, Trevor, was a classmate of my daughter's at the Bement School and I recall how the first school birthday party that she attended was at the bus garage for Trevor's 6th birthday. Appropriately, Trevor is a hockey player and my daughter is a figure skater (when she is not engaged in other sports and pursuits). There is, however, not only a transportation connection between our area and the Olympics. Jon Quick, a former star hockey goalie at UMass Amherst, has been selected to the US Olympic hockey team. With the US figure skating national competition now completed in Spokane, Washington, the various US Olympic skating teams (men's, women's, pairs, and dance) have also now been identified. We wish all the athletes, as well as their coaches, family members, friends, and the organizers of these Olympics exquisite competition and experiences! The issues of communications, and associated coordination, along with logistics and the bottlenecks, have permeated the post-earthquake humanitarian relief efforts in Haiti. Ironically, and, in a strange way, propitiously, it turns out that Haiti's Internet connectivity is robust precisely because its telecommunications infrastructure is so underdeveloped. Specifically, as reported in the IEEE Spectrum Tech Talk, most Haitian ISPs connect to the Internet via satellite and are not dependent on the country's lone undersea fiber optic cable link, which was knocked out the during the quake. The challenge for engineers now is the proverbial last mile--getting local connections to satellites restored so NGOs can get online. What is needed, from a communication hardware perspective, is that additional capacity, in the form of bandwidth, be added for satellite communications. As I had written in this blog early on during this crisis, the International Telecommunications Union (ITU), a branch of the United Nations, located in Geneva, Switzerland, is providing additional satellite communication capacity (as it has done in numerous disasters prior). 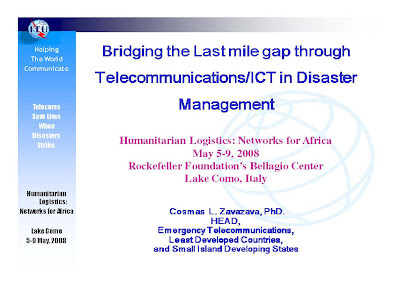 Dr. Cosmas Zavazava, the Head of Emergency Communications at the ITU, spoke at the humanitarian logistics conference that I organized, under the auspices of the Rockefeller Foundation. You can find his presentation here, along with many others, or access it directly below. Our book, Fragile Networks: Identifying Vulnerabilities and Synergies in an Uncertain World, discusses how to identify the most important nodes and links in networks from telecommunications networks to transportation, logistical (including humanitarian ones), and even financial networks. The United States and western Europe depend heavily on their copper and fiber optic interconnections (which are physical) for phone, Internet, and cable TV. There may be a very ironic lesson here and a critically important one in terms of the resiliency and robustness of telecoomunication infrastructure. Cristobal Conde, the President and C.E.O. of SunGard, a software and IT company, provides some very illuminating and effective management insights in this interview in the New York Times. His experiences have led him to conclude that "flatter" is better, and that collaboration is key in organizations. He provides a unique perspective in how to give employees credit for their ideas and contributions through Yammer. Recognition (and not only money) is what many employees seek, and especially from their peers. In academia, we have peer review when it comes to our journal articles and many grants but these tend to be anonymous. In organizations, those public pats on the back for good work done can serve as substantive recognition and as fuel for further endeavors and achievements. This article deserves a close reading. I also applaud Mr. Conde, for whom English is not a first language, for his emphasis on the importance of good writing skills in his employees. Plus, he tries to scope out 90 minutes of his work day in which he can think without interruptions. As Director for the Virtual Center for Supernetworks, I try to synergize the activities, whether in research or education or service of our Associates. I am personally proud when they excel since we then all benefit. Our relatives (once, twice, and three times removed) and many others in the US were watching the results of the Massachusetts election yesterday for the open Senate seat held formerly by the now-deceased Ted Kennedy. Adam Nagourney in today's New York Times writes about the outcome of this election in a news analysis with Scott Brown, a Republican, winning the Senate seat over Martha Coakley, a Democrat. The comments that follow this article are also quite interesting. This news story with large political (and other) ramifications has overtaken the Haiti earthquake disaster on several news sites. I regularly get asked whether Adam Nagourney is a relative of ours and although there are quite a few "Nagurneys," a surname that I acquired by marrying my husband, as far as we are aware (and his father did some research on this), we don't think that we are related. The origin of the name is Slavic, and the Ukrainian version would be "Nahirnyj," but the folks at Ellis Island altered it to "Nagurney." In different Slavic languages, the origin is "na hori (Ukrainian)" or "na gori (Russian)," which means "on the mountain." Legend has it that the family farm was on the "side of the hill." As the humanitarian operations in Haiti post its devastating earthquake are evolving in time, it is essential to recognize the human element in the critical needs supply chains. As we read and watch the events unfold, we, as researchers, educators, and practitioners, need to recognize the pivotal role that humans are playing in the dissemination of the food, clean water, medicines, and services. The essential supplies are being delivered through a combination of organizations from the UN, the various humanitarian NGOs, as well as the military from the US, with the US and numerous countries from around the globe airlifting the essentials. Ultimately, it is humans helping humans, through the creation of real-time, agile, and adaptive supply chains, for product and service distribution. It is people, working together, who are physically constructing and becoming parts of the chains to ferry and ferret supplies to the Haitians, whether from the trucks, or the helicopters, or the boats, or from the hospitals that have been set up. The other networks from financial ones to information ones are further supporting the humanitarian efforts and helping to reinforce the fragile supernetwork for recovery. All those who are physically lending a hand, from the medical professionals, to the logisticians, to the engineers, and the governmental units, deserve our support and deepest thanks. Last night I had a nightmare. In my dream I was back in high school, which was not my alma mater, Yonkers High School, but, rather, the high school that my daughter attends now, Deerfield Academy. There I was, back in high school, but with a PhD in Applied Math (specialty in operations research), and with a Phi Beta Kappa key from Brown University. In the dream, I was completely evaluating the direction my life journey had taken me and I was being given a chance to take high school courses and, in a sense, to start over again. However, I could not relate to the teachers and just could not fit in. Yes, my daughter was also at the same school in my dream, which she adores in reality, and tells me that she would not change a single thing about Deerfield Academy. The nightmare was so real that I woke up this morning by literally jumping out of bed. Then I realized it was Martin Luther King Jr. Day, a day in which we recognize and remember the journey of this great man. To commemorate this day, I listened to his "I Have a Dream" speech, while my daughter at her school is having a full day of special memorial activities. I am an immigrant, having been born in Canada, and with my first language being Ukrainian. My nightmare cannot compare with the earthquake devastation and post-aftermath in Haiti. An article in a Canadian newspaper (yes, I still love Canada) traces some of the history of the island of Hispaniola, which is home to both Haiti and the Dominican Republic. It attempts to explain how the environment and various policies over centuries have resulted in such different national histories. As for the resolution of the nightmare, I am most glad that I am not back in any high school, although Yonkers High School was a fantastic amalgamation of students, diversity, and outstanding teachers and led me to Brown University, whose President is the amazing Dr. Ruth Simmons, one of 11 children, whose parents were sharecroppers in Mississippi. Let's continue to live the dreams and to help the less fortunate! Aid Gridlock in Haiti, Being WISE, and What Should a Mother Do? The airport in Port-au-Prince at which many of the relief (and military) planes are landing, is gridlocked, with supplies not being disseminated in a coordinated and effective manner to the victims of the earthquake in Haiti. This article shows the huge frustration experienced even by the relief workers who are lacking trucks, and in many cases, even fuel, to disseminate the needed water and food. Coincidentally, this past term, I have had several meetings with the coordinator of FlexNet, Mr. Matthew Bader, who works in providing trucks for supply deliveries in humanitarian operations. Doctors are working with primitive supplies, searching for antiseptics, alcohol, in most any form, as well as clean water, in order to do the necessary surgical procedures and to try to save lives. The medical situation is so dire -- heroic medical professionals are working in settings like Gettysburg, the Civil War battle that took place in the middle of the 19th century. Hospitals in Haiti, even pre-earthquake, were not sufficiently stocked. There is a better picture now in terms of the coordination of relief activities, which is, nevertheless, still lacking in numerous respects. I spoke with Dr. Jose Holguin-Veras of RPI, who gave a brilliant lecture in our Speaker Series this past term on Emergency Logistics and the Response to Hurricane Katrina. He is a native of the Dominican Republic (DR), the country which shares the island with Haiti. He told me that he is now advising the Dominican Republic on logistics, since that country and its airport are a major logistics relief staging area for Haiti. He told me that, once the supplies arrive at the border with Haiti, the United Nations is taking over, because of the extraordinarily challenging situation in Haiti now in terms also of safety. I have tried to reach Dr. Denise Sumpf, who works for the UN, and who also spoke in our series and who is an expert in transportation, but I have not had success. Since several dozen UN peacekeepers in Haiti perished in the earthquake, the coordination of the relief efforts has suffered, as a consequence of the lack of command and control, early on. My daughter, last year, at precisely this time, was packing up supplies to take to an orphanage in San Cristobal in the DR, to begin a week's community service there with her 9th grade class at the Bement School. This orphanage is west of the Santo Domingo airport in the DR, to which many relief planes have also been landing. The supplies are then transported over roads to the Haitian border and onwards in treacherous conditions. This year's 9th grade at Bement is to be journeying to help out in the same orphanage in less than two weeks. Last year, I had the usual concerns about allowing a child to take on this special trip. This year, there is the Haiti earthquake and its aftermath to contend with. I hear that this community service trip is still on. It signifies that one should do whatever one can and is capable of to help the less fortunate. As an educator, I have been trying to do my best in conducting research and in disseminating knowledge about logistics and transportation and the importance of networks and infrastructure to societies and economies. I hope that more students will assume careers in humanitarian logistics. There is a very thoughtful writeup on humanitarian logistics and WISE (Women's Institute for Supply Chain Excellence), in which Ms. Melanie Miller, of Accenture's Supply Chain Management Practice, includes a quote by me. With the number of disasters, and their severity growing, we, as educators, can inspire others. Although the New York Times has assembled a group of experts to comment on the Haiti disaster response, rescue, and recovery, the group has no logistics and operations research experts. However, it is precisely the latter type of experts that can assess what can be done in such crisis humanitarian operations and, interestingly, they can be found in business schools. INSEAD, considered one of the top business schools in the world, has now released a video interview with Mr. Rolando Tomasini and Dr. Luk van Wassenhove, which provides a very knowledgable and balanced perspective of the crisis. Mr. Tomasini was one of the speakers at the humanitarian logistics conference that I organized and that was hosted by the Rockefeller Foundation. At the conference, he spoke on his joint work in the field with Professor van Wassenhove. Information on their book, Humanitarian Logistics, and our Fragile Networks book, can be found on the above conference website. You can also reference these books and several other ones on the topic of humanitarian supply chains here on Amazon.com. I have been writing about the crisis in Haiti and the lack of coordination and collaboration. What was/is needed (and as the above two researchers emphasize in their videocast) is centralization of the logistics operations as well as more careful scheduling and delivery of the critical needs supplies. Indeed, having the proper command and control in place, which, in this case, necessarily has to be by an outside body (politics aside) due to the destruction of many of the government bodies in Haiti, may have assisted in the delivery of the food, water, medicines, along with the personnel in a timely and more logical manner. We are reading about doctors and medical personnel who are waiting for hours at the airport in Haiti for the medical supplies to arrive as well as for the vehicles to transport them to the wounded. The field of operations research, as a discipline, dates to World War II, and it has evolved into a knowledge base renowned for expertise in transportation, logistics, humanitarian operations included, and numerous many other applications. We need the command and control (and communications, of course) structure to succeed in a humanitarian operation and recovery on a massive scale. Then the additional hard work begins -- the reconstruction and development, which must be done with careful and well thought out, rigorous planning. The New York Times is reporting today on the logistical nightmare faced by relief workers in trying to get the critical needs supplies to the victims of the earthquake in Haiti. Airplanes have had to circle from 2 to 3 hours before landing; there is no central control of distribution of supplies even after the planes land, plus many of the roads (which were not in good shape even prior to the quake) are now severely damaged if not littered with debris, and the principal port and equipment for unloading supplies have also been seriously affected. The relief workers are trying to determine alternative routes so that they can deliver the clean water, medical supplies, and food. At the same time, congestion is becoming an issue (sometimes referred to as convergence in humanitarian logistics parlance) since vehicles and supplies do not have sufficient warehousing capacity in which to offload and from which to distribute. The situation in Haiti brings to mind a measure in network analysis, notably, in transportation and telecommunications, called the price of anarchy, which is the ratio of the total cost under user-optimizing (decentralized) behavior to the total cost under system-optimizing (centralized) behavior. We recently published a paper on transportation network robustness in the presence of degradable links in the International Transactions in Operational Research and related our new measures to the price of anarchy. Had Haiti had a more resilient and robust network infrastructure, the losses may not have been so severe. As this article in the Times and others in the press have stated, this is a disaster of monumental proportions. What will happen in the next few hours and days will determine also how many of those who have survived will be able to go on in such horrendous circumstances. What will transpire in the next couple of weeks and months in Haiti will be a serious case study on the interplay of development, reconstruction, and humanitarianism. The calamitous earthquake in Haiti is now resulting in a humanitarian emergency of immense proportions. Those of us who work and conduct research in logistics are eyeing the evolving events in real-time. Many of the frustrations lie in not being able to apply best practices when already fragile networks are further disrupted because of chaotic events. As academics, we can do much regarding capturing the state-of-the-art of humanitarian logistics knowledge so that when crises occur, even of monumental proportions, they can be put to use. For example, collaboration amongst organizations is key, which we are not seeing (yet) in Haiti. Also, centralization is essential for assessment and information capture and dissemination. In Port-au-Prince, the network infrastructure has been decimated from the roads and electric power lines to the hospitals, schools, homes, and even government offices. The problems now are ones of transportation and logistics and in supplying the victims with their critical need products from food, clean water, to medicine. What we can also offer is a readily-accessible forum and venue that contains collections of lessons learned from past disasters, including Katrina. Towards that end, I am providing related links to talks on Hurricane Katrina, Fragile Networks, and other related topics here. In addition, a website devoted to humanitarian logistics, which contains numerous presentations and documentation can be found on the Rockefeller Foundation Bellagio Center Humanitarian Logistics site that I developed for the conference that I organized at the center. There you will also find information on our Fragile Networks book, which contains information on supply chains in humanitarian operations and the synergies associated with collaboration. In addition, Dr. Cosmas Zavazava, one of the participants in this conference, who is Chief of the Division of Emergency Communications, at the International Telecommunication Union (ITU) in Geneva, Switzerland, is helping to coordinate the communications in Haiti. He had previously coordinated the telecommunications after Cyclone Nargis hit Myanmar/Burma. His presentation on the critical importance of telecommunications during and post disasters is also posted on the link above. Today, we completed a paper on the evaluation of supply chain network performance under a spectrum of disruptions as are occurring in Haiti. If we cannot physically be there to help, we, nevertheless, have to assist in whichever way that we can. Our Fragile Networks book (in a rather freaky coincidence) has been listed as an interesting new book by MCEER, a center which focuses on earthquake engineering to extreme events. The worst earthquake in two centuries hit Haiti, the poorest country in the western hemisphere, yesterday. The pain, suffering, and devastation are horrific. This natural disaster is creating havoc for humanitarian operations because of the destruction of much of the infrastructure, such as roads and hospitals, in the capital, which was the hardest hit. Interestingly, the World Food Program had stockpiled food supplies in Haiti in preparation for disasters, with hurricanes, being the most expected ones. It is now also airlifting food supplies. Haiti is on an island which is also home to the Dominican Republic. Exactly one year ago, my daughter and her classmates at the Bement School in Deerfield, Massachusetts were packing up to go on their trip to the Dominican Republic to help out in an orphanage. This year's 9th grade class at Bement is also scheduled in early February to travel there. The airport in Santo Domingo in the Dominican Republic is now being utilized to assist in Haiti's recovery. Last year, with excitement and nervous anticipation, I let my daughter travel there on a community service mission, which deeply affected all those who took part. I wonder whether this year's trip will take place given the extreme seriousness of the disaster in Haiti. She had, this past weekend, completed a huge photo montage of memories from last year's trip to the Dominican Republic that a teacher was going to deliver to the orphanage. I, in the meantime, was busy working on a research paper with a co-author on the assessment of supply chain performance in the case of disasters (an ironically timely topic) for submission to a special issue of a journal on transportation network vulnerability. Our hearts and prayers go out to all those affected by this earthquake. Labels: Bement School, critical needs, earthquake, Haiti, supply chain disruptions, supply chains. The new edited volume, Multiple Criteria Decision Making for Sustainable Energy and Transportation Systems, is now available. The book, edited by the international group of scholars consisting of Professors Ehrgott, Naujoks, Stewart, and Wallenius, of, respectively, New Zealand, Germany, South Africa, and Finland, is a collection of papers presented at the Multiple Criteria Decision Making (MCDM) for Sustainable Energy and Transportation Systems Conference that took place January 7-12, 2008, at the University of Auckland in New Zealand. 137 delegates from 39 countries on six continents took part in this wonderful conference. I had the honor of being a plenary speaker, along with Professor Jim Petrie of the University of Sydney and the University of Cape Town. My plenary talk was titled, Multicriteria Decision-Making Analysis for the Environment: Sustainability and Vulnerability of Critical Infrastructure Systems from Transportation Networks to Electric Power Supply Chains. This edited volume is a very timely collection of MCDM models and methodologies applied to sustainable energy and transportation systems. Trisha Woolley and I contributed the paper, Environmental and Cost Synergy in Supply Chain Network Integration in Mergers and Acquisitions, to it. We congratulate the editors and the authors as well as all the conference participants for an excellent scientific conference, coupled with glorious memories. I have included several photos that I took while at this conference in Auckland, New Zealand, which took place exactly two years ago! Today's Boston Globe has a feature article on Mike Eruzione in its Sunday magazine, complete with a cover photo. The article is entitled, 15 Million Minutes of Fame. As you may (or may not) recall, Eruzione scored the winning hockey goal in the Lake Placid Winter Olympics in 1980. 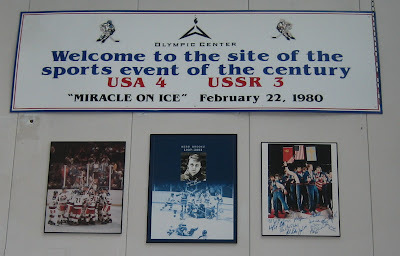 The article covers the US winning the hockey gold medal by a team that was assembled by the coach, Herb Brooks, and the life that followed for Mike Eruzione. Some of you may have seen the movie, Miracle on Ice, that was based on this extraordinary team, their coach, and the series of victories that led to their gold medal. On January 15, 2009, we had the Miracle on the Hudson with the "safe" landing of the USAIR plane in the Hudson River by Captain Chesley "Sully"Sullenberger. Nice to reflect on the Miracle on Ice, as well, especially with the upcoming Winter Olympics in Vancouver. We were at the Olympics training facility at Lake Placid two summers ago since my daughter, who is a figure skater, was training there. I thought that I would share the photos above which we took there, as we start to anticipate with a lot of excitement the upcoming Winter Olympics in Vancouver, Canada, that begin on February 12, 2010. 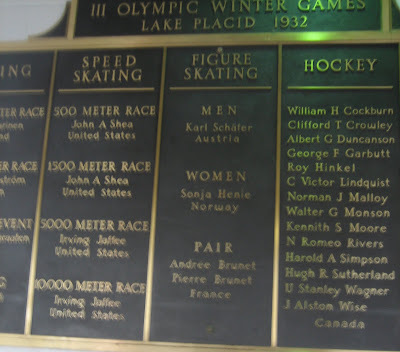 The photos include one of the tableau of medals given out at the 1932 Olympics at which Sonja Henie, the figure skater (and later medical doctor and motion picture star) excelled. The rink in the photo above is where the Miracle on Ice took place. The awards banquet that was sponsored by the Council of University Transportation Centers last evening at the Omni Shoreham hotel in Washington DC was a great success. Above are several photos taken at the event at which Dr. Patrick Qiang received the Charles V. Wootan Award. His mother was visiting from China and was able to attend. Dr. Qiang received his PhD last May from the University of Massachusetts Amherst. His concentration was in Management Science at the Isenberg School of Management. Patrick was my 14th doctoral student to received the PhD. All of us who have had the privilege to work with Patrick at the Virtual Center for Supernetworks congratulate him on his national dissertation award! He has now completed his first term as an Assistant Professor at the School of Graduate Professional Studies at the Pennsylvania State University Great Valley campus. On January 29, 2010, the Symposium on Transportation Network Design and Economics will take place at Northwestern University in Evanston, Illinois. This symposium has been organized by Professors David E. Boyce and Hani S. Mahmassani to honor and celebrate the visit of Professor Martin Beckmann to Northwestern. The symposium program is now available. Professor Beckmann is the only living author of the classic book, Studies in the Economics of Transportation, published in 1956 by Yale University Press, and co-authored with Bart McGuire and Chris Winsten. To mark the fiftieth anniversary of this classic book, in 2005, we organized several sessions at the San Francisco INFORMS meeting and both Beckmann, and McGuire (who died two months after), came to the sessions and took part in the festivities. Please click here for those talks and many photos as well as for a link to the classic book, which is now available online. Professor Beckmann was on my doctoral dissertation committee at Brown University, which was chaired by Professor Stella Dafermos, and I remember so well the question that he asked after my defense plus the party that I gave in Barus and Holley (that well-known engineering and physics building at Brown) afterwards. Beckmann, a true cosmopolitan and lover of travel and terrific food, especially enjoyed the European tortes that I had prepared for the occasion (although we were quite poor grad students at that time and did not have all the right utensils for slicing). He took advantage of a plastic spatula to do the job. Professor Beckmann, I hear, will be traveling by train to Northwestern, from Providence, Rhode Island, and the day before the symposium, will be speaking on his reflections of the classic book (BMW). Boyce, Mahmassani, and I wrote a journal article on the impacts of BMW, which was published in Papers in Regional Science in 2005 . At Northwestern, I will be speaking on some of my latest work and will be delivering the paper, Supply Chain Network Design Under Profit Maximization and Oligopolistic Competition. I am very much looking forward to this symposium, which will honor the work of a truly great scholar and human being. For those who would like to see additional photos of Professor Beckmann, who, as Professor Boyce, was honored with a Lifetime Achievement Award in Transportation Science, please click here. These photos were taken in various locations around the globe, including Australia and Sweden. The CUTC (Council of University Transportation Centers) awards banquet will take place tomorrow evening at the Omni Shoreham hotel in Washington, DC. My former doctoral student, Dr. Patrick Qiang, will be receiving the Charles V. Wootan award at this banquet for his dissertation, Network Efficiency / Performance Measurement with Vulnerability and Robustness Analysis with Application to Critical Infrastructure. At this banquet, others will also be honored. It is thrilling to have one's doctoral student receive a national dissertation award and to have hard work recognized in this significant way. The Charles V. Wootan Award is for the best doctoral dissertation, based on a national competition, in the transportation planning and policy category. More information about the CUTC, the banquet, and associated awards can be found here. This awards banquet precedes the Transportation Research Board meeting in Washington DC, to which thousands will be traveling (using all sorts of transportation modes). I wish everyone safe travels and very rewarding festivities and conference! Some of the preceding press coverage of Dr. Qiang's award can be found here. More information on Dr. Patrick Qiang is available on his website. In many instances, I would have liked to have maintained an anonymous blog in which, in parallel, I could expound on some of the truly unique experiences of being a female professor in a technical field. Of course, one could assemble and compile such ruminations and ultimately write them all up in a memoir, which probably would not be anonymous. One has choices: to write an anonymous blog (in which case it is then easier to admit comments) or to write under one's name (and to allow comments or not). Two of my favorite anonymous blogs are: FemaleScienceProfessor and Transportation Research 101, written by "Safetea Lu." The former blog is written by a female full professor at a major research university, whereas the latter is written by a transportation professor (whose name I think I have figured out). Both of these blogs have unique features and speak to the reality of being an academic researcher and teacher. Both are informative and entertaining. In fact, some of the musings of Safetea Lu on Massachusetts and transportation research I found very interesting. As for blogs that have names associated with them, some of my favorites can be found at: alltop operations research. I also recommend Professor David Levinson's blog and, of course, Tom Vanderbilt's blog. Professor Levinson is scheduled to give a seminar at Northwestern University on January 21, 2010. I will be at Northwestern at a symposium but one week later. Tom Vanderbilt, the author of the terrific book, Traffic, spoke in our Speaker Series at the Isenberg School last year. Yesterday, my husband marched to our local cafe in North Amherst, the Cushman General Store. There he joined two of his friends who were having a hearty breakfast and the conversation was about Vanderbilt's book and a discussion on safety and rules and regulations ensued. This is a mark of a great book and speaker -- months and years after, the audience still finds insights gleaned for discussion! Many this past weekend were traveling back from their holiday breaks and New Year celebrations. The place not to have been was last Sunday at the Newark airport, from which one of my former doctoral students, Trisha Woolley, and her family were flying back from to Dallas. describes what transpired but the photos of the human traffic jam are even more enlightening. At least being in a human traffic jam on 5th Avenue during the holiday season is much more entertaining and fun! In contrast, Verlyn Klinkenborg writes about the peace of winter in the New York Times - Snowing Forward, which I could also relate to. After completing a pile of journal article reviews and also after revising one of my own papers, I needed a break yesterday. I took a long hike in my neighborhood in Amherst. The photos above were taken during the hike. It is always wondrous to see animal prints in the snow. Clearly, deer had wandered into our backyard as well as the usual cast of neighborhood cats and other friendly characters. The stream was partially covered with a heavy blanket of snow. The peace and serenity under a golden sun were exquisite. It was a perfect day in which to combine serious academic work with the joys and beauty of the winter season.